The two-story structure allows for research into human factors relating to air traffic control. 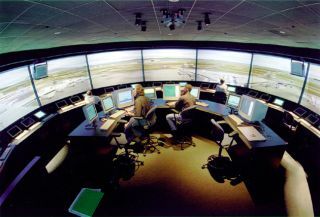 In this historical photo from the U.S. space agency, NASA's Virtual Airport Tower, located at the Ames Research Center, Moffett Field, California, is pictured in January 1995. The Virtual Airport Tower's two-story structure is a full-scale, highly sophisticated simulation facility that will emulate Level 5 air traffic control towers and the busiest airports. It provides the platform to conduct in-depth human factors studies with quantifiable results using actual air traffic controllers, airline dispatchers and airport managers.